The next game from Trine developers Frozenbyte, Shadwen, will be out this May at less than 50% of its original launch price. Is more than half off the launch price still to expensive for you? You might be better off with the best free games on Steam then. The trailer shows off some of the game’s stealth gameplay, all wrapped in the same beautiful environment lighting of the studio’s 2009 side-scrolling puzzle platformer. This time, however, the action looks like it plays out in more dimensions as you grapple and stab your way through a quiet dusky town with a small girl as a sidekick. As a stealth game, the goal is to remain undetected, but rather than result in a game over if you are caught, Shadwen offers the ability to rewind time if you make a mistake, though only so far. 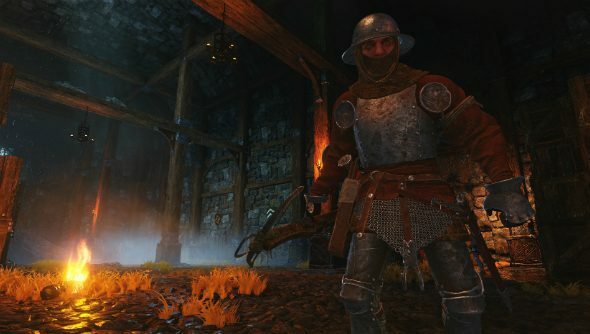 Shadwen’s launch price has been dropped from $35 to $14.55 after the community completed a series of tasks in the demo multiple times reducing the price every time. The game will be available on Steam, GOG and the Humble Store when it eventually releases sometime next month.